Home › Easy Balloons › Welcome to Easy Balloons 29.04.13. Welcome to Easy Balloons 29.04.13. Hi and a very warm finally spring-like welcome if this is your first visit to our rather eclectic site and thanks for returning if you have been here before. From miserable long faces and cloudy drizzly days we are now firmly spring-loaded. The grass is growing and things are now drying out. Woodworm has reared its ugly teeth again. I don’t know how many times its been mentioned (and we do to everyone with brown cane baskets) but woodworm really loves the big brown coloured cane in the bottom of Cameron baskets. They also have a taste for the smaller horizontally woven cane on occasions. These things are always relevant and in most cases the odd hole or small bit of localised stuff that resists a screwdriver will usually be fine. The odd floor cane can be replaced but get half a dozen nibbled away or the larger end canes then you are on to a non-winner. Prevention is simple. Give the basket a good annual dousing of woodworm treatment. A gallon will set you back about ten or twelve quid depending the brand you buy but any of the proprietory mixes will do. Rentokil or Ronseal are as good as anything. If you discover woodworm holes take a piccie or make a note of the damage and keep an eye on it. We finally got the bit about Dave Jenksie’s dad’s Halifax out and it appears somewhere. I’m still sorting out a couple of other outstanding promised articles which I will do me best to finish. Problem is that if the sun is out so am I so not much writing gets done. Somewhere else should be a bit about adventures in a cloudhopper by Barry (bruises now gone) which he sent me and I lost. Typical. Talking of lost the Go Ballooning demise has now moved past the Creditor’s Meeting and it seems unlikely anyone will get very little of nothing. The Liquidator has been appointed and a steering Committee formed to assist with his enquiries. There is a bit about it in the News and that will be that for a while no doubt until their findings are published. Sadly there has been an accident in Peru where a balloon ended up ditching in the sea. Very fortunately five passengers were rescued but the pilot and a male passenger are still missing. Our thoughts go out to them. The round-to-it department across the yard is becoming the never-get-round-to-it department so time for a another onslaught. Still we can never be accused of having nothing to do on a rainy day. I’ve now had me annual barbering courtesy of Scissor-hands Fats so the new bloke with short hair is me! The idiots from HS2 have sent two more bat-watching teams out and a girl with a clip board and wellies to pludge around the field looking for goodness only knows what. Gives the dogs someone to bark at though. One of the bat people said they were setting up a bat ultrasound recorder (looks like a radar station out the back) in the field. We explained that they are all round the buildings. “Have you got bats?” he asked somewhat surprised. “Well it is a farm”, we explained. Clearly they never spoke to the other mob who found a colony in the farmhouse roof. 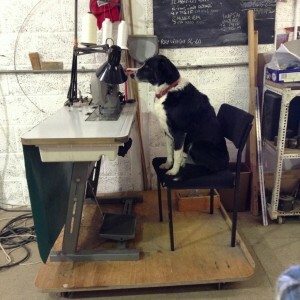 To take Dotty’s mind off chasing HS2 workers John is training her up to sew. Sadly she can’t operate the foot pedal and feed the material through at the same time. Don’t even go there when it comes to changing bobbins! I don’t think she’ll ever get the hang of it. As ever, thanks everso for visiting. We hope you enjoy the site and find something of interest to make you grin. Happy flying. Best regards Chris, Jane and Alice.